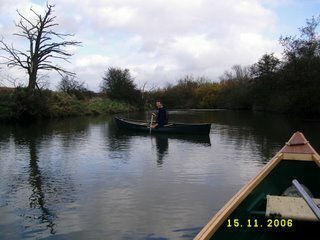 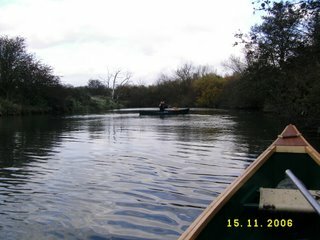 Went for a paddle on the Stour yesteday from Grove Ferry to Fordwich and back. 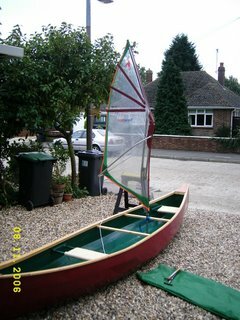 Had a few issues with the rig, but it was only the second time I have tried to use it, initial results are promising, got up a nice bit of speed but need to fit a leeboard and rudder not to mention jam cleats and associated rigging, and I have to sort out a better method of fixing the mast steps as the both came out! 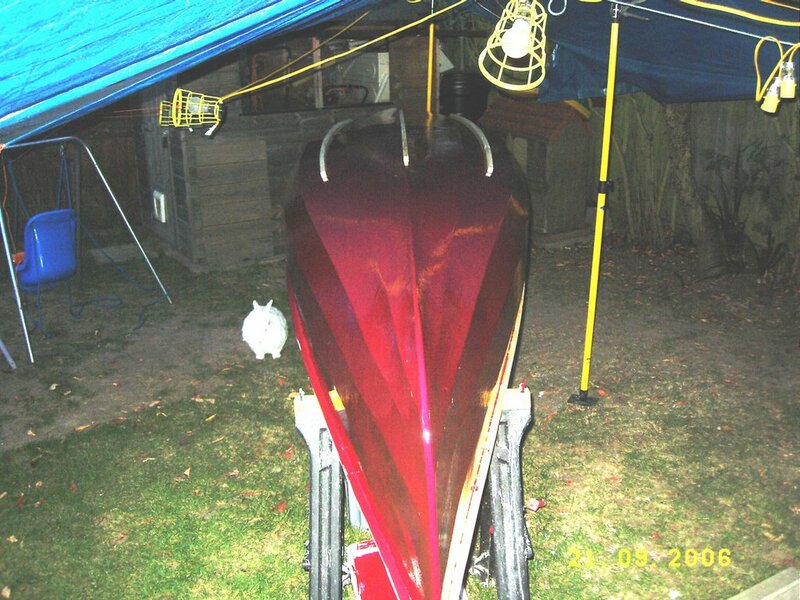 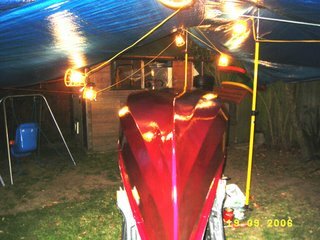 fortunately I pre-empted a problem with them so I only epoxy'd them to the bottom of the boat and did not screw through thus no damage done. 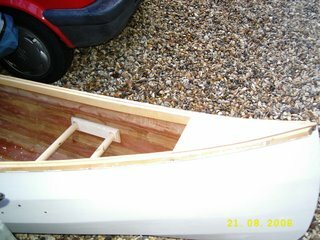 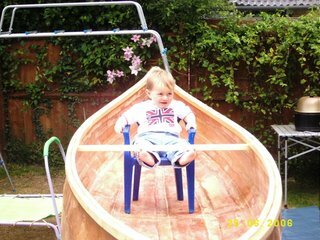 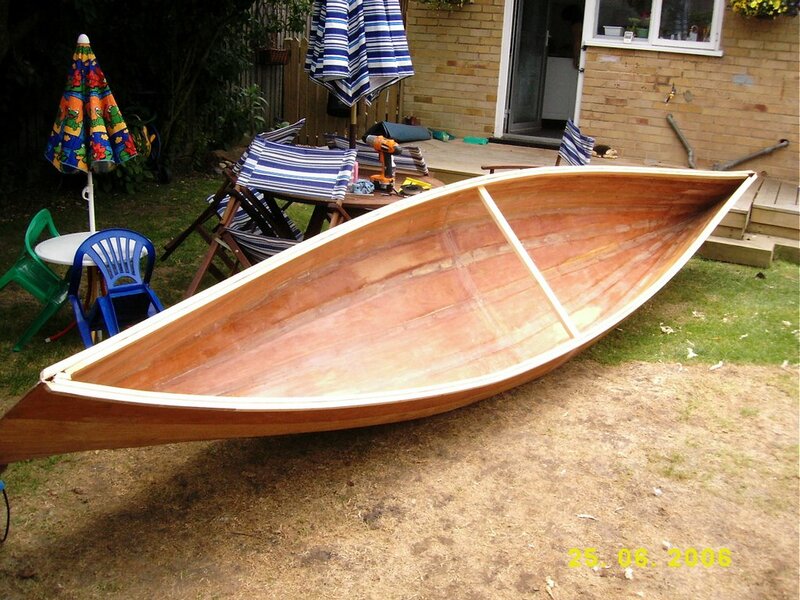 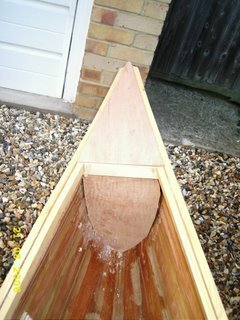 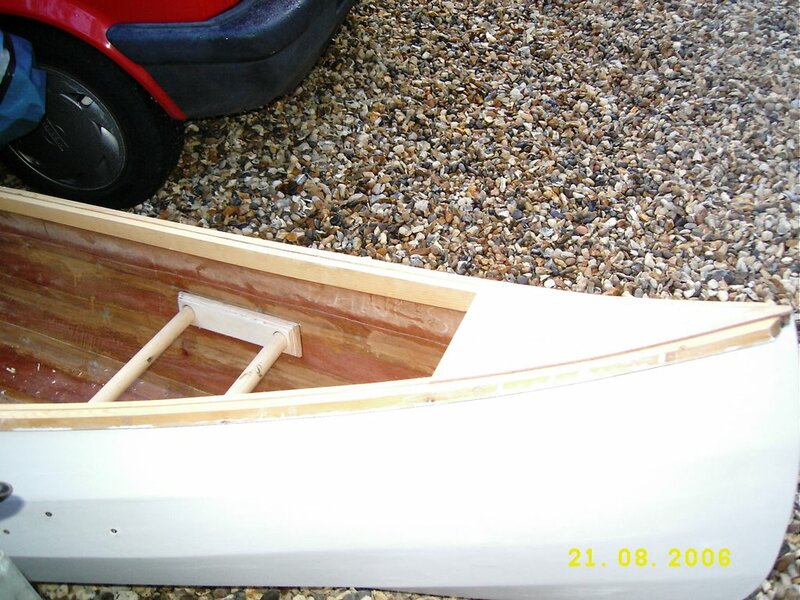 I have placed a couple of mast steps in the bottom of the hull, in different places because if paddling solo you seem to generally use the front seat (going backwards) and if tandem you obviously use the normal seating thus the rig needs to be out of the way for each arrangement, they are made from 2*3/4inch ply blocks one with the hole drilled in and glued to the other as a base, these were glued to the hull and then an epoxy fillet placed around the edge, I did not want to screw them in a) so that they are not a permanent feature and b) if they rip out then the hull should not be holed. 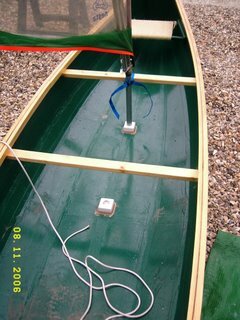 Fitted the runners, these are glued and screwed from the inside, I did not know if they should be straight or follow the contour of the hull, I opted for following the contour as it looks better, this may affect the tracking though. 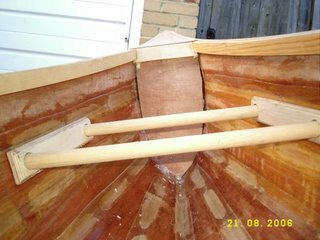 I removed the masking tape and it hadn’t done its job! 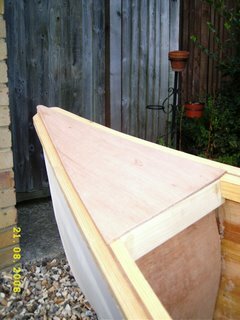 Wish I had used insulating tape, I do like making more work for myself! I will need to make good before the varnish goes on. 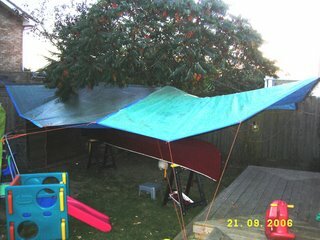 A shot of my fly camp, the wind picked up last night so I had to get some extra guy lines on, looks a mess but its done the job and the rabbit (pictured above) could not attack it like it did the tent! 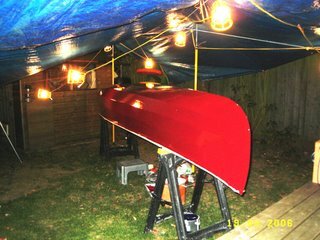 Hung a tarp up in the garden and Dave has lent me some lights again, it looks like a Bedouin encampment but it serves a purpose. 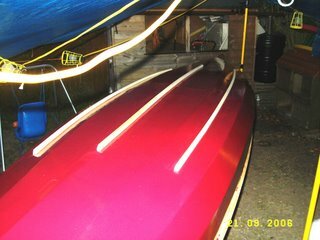 I masked up the gunwales and have given the hull several coats of exterior gloss (Wild Berry) although its not being painted onto a perfectly smooth surface I am using gloss rollers so the finish is good and looks great from a distance. 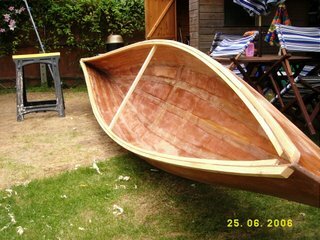 The runners are to be fitted next and will not be painted, the whole of the hull, gunwales, thwarts and breasthooks will get a coat of yacht varnish (hope it does not react with the paint!) 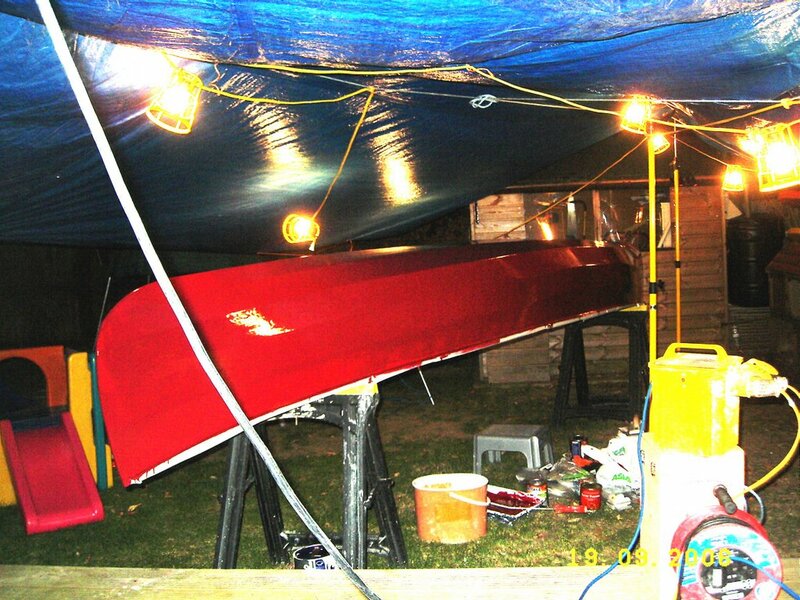 the interior will be dark green exterior gloss. 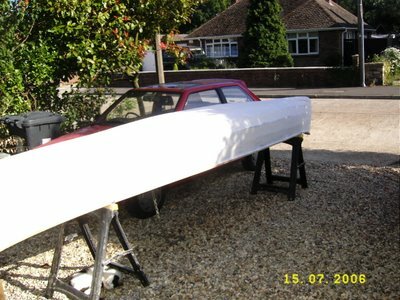 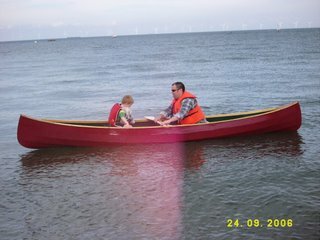 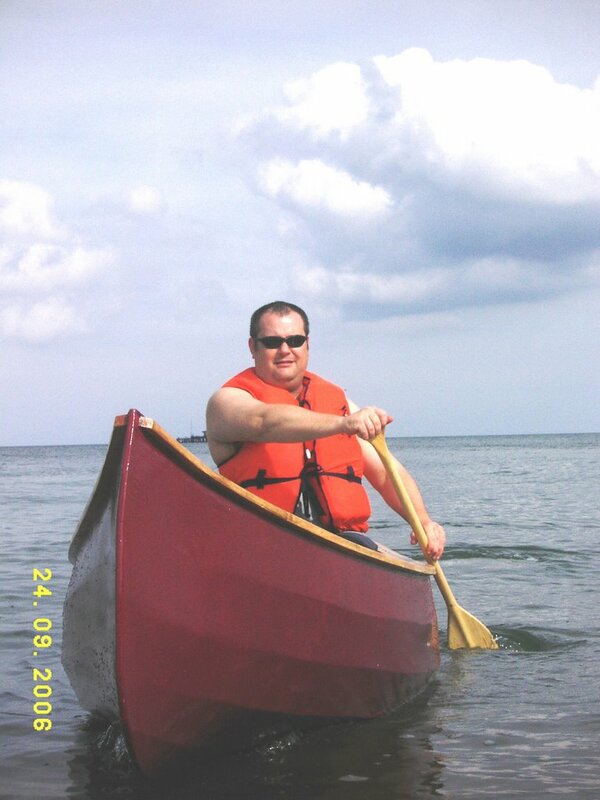 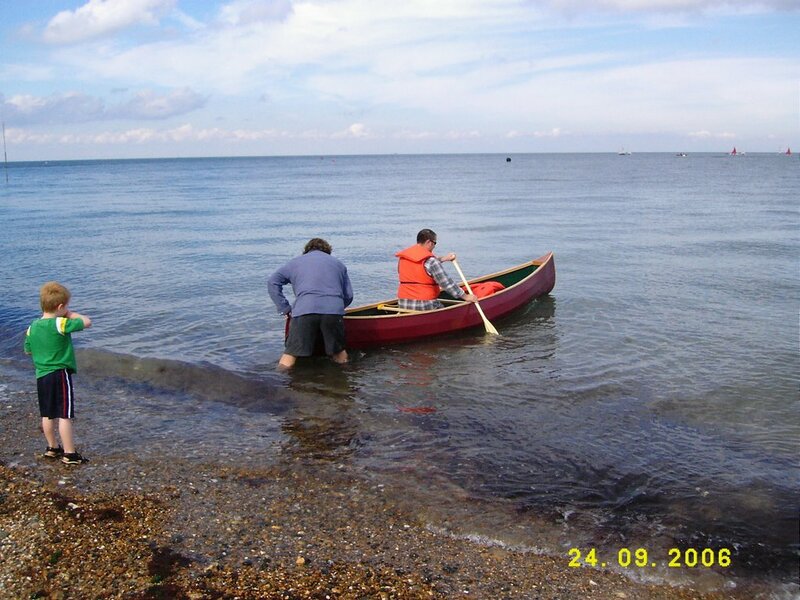 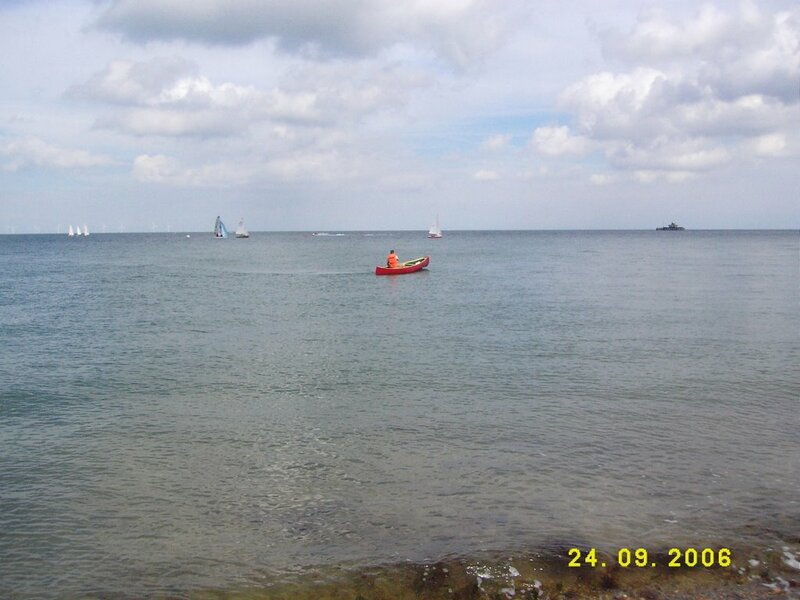 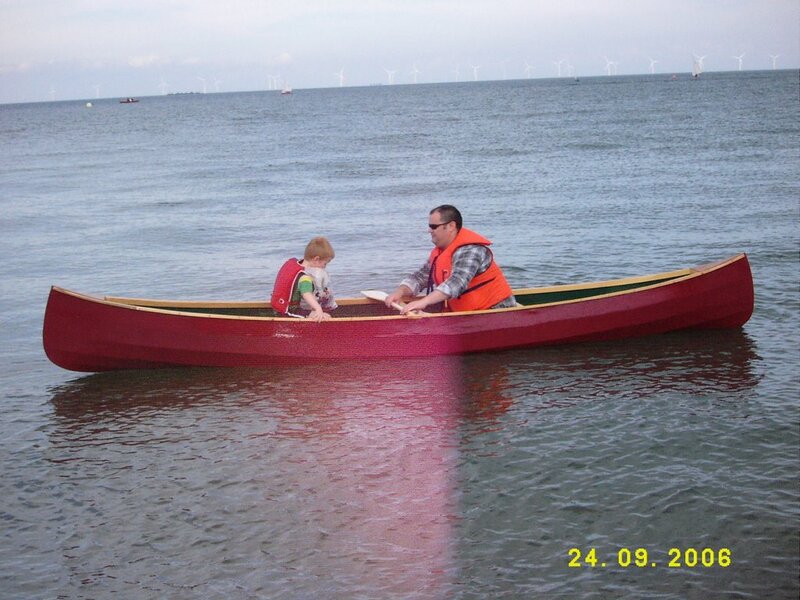 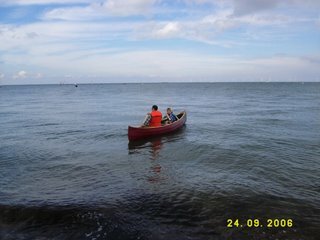 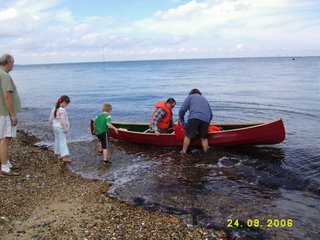 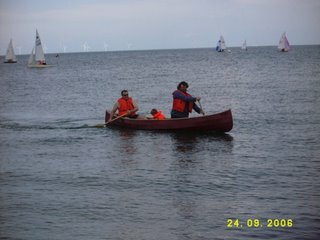 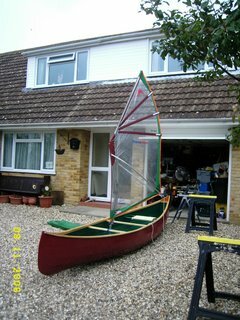 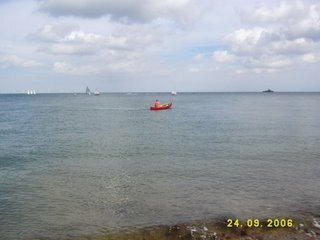 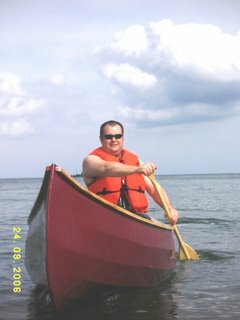 It’s now September, not had much of a chance to do anything to the Canoe during August due to family commitments and the weather. The hull has been filled and painted in an undercoat, which subsequently peeled off due to an unexpected downpour and me forgetting to put a tarp over it, it got another rub down and some more undercoat and seems to be not too bad. 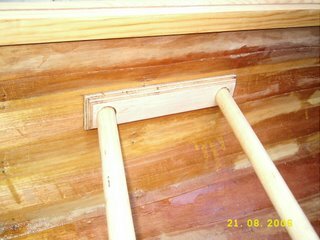 Dave kindly gave up a whole Saturday to help me with the woodwork, in fact Dave made both of the bulkheads and breasthooks while I concentrated on the seats Dave came up with a neat idea of making a grab / carry handle at the joint of the breasthook and bulkhead with a slight bevel backwards and upwards for a nice grip, unfortunately I managed to completely knacker his hard work by filling the forward and aft compartments with too much expanding foam and nailing them down, the ply on the bulkheads popped out of their glue block settings and will not go back without complete removal and re-fixing, they will have to be re-cut as the bow and stern actually bulged out slightly too (this actually happened after 24hrs so beware it still expands long after you would have thought it safe) Still at least we know the void is filled, I just feel gutted that it was all a perfect fit and now it was a lot of wasted time, as I said before this is a massive learning curve!! The seats on the other hand seem to have gone without a hitch, being of more generous proportions I opted for hopefully a stronger seat fixing solution, sections of 3/4inch ply were cut of approx 10inces by 3inces, two slightly offset holes were drilled in each to take a dowel and the edges had a nice profile routed onto them, the inside of the hull will be painted so I am not concerned about end grain showing, the dowels were placed and the fixings glued and screwed from the outside, if a seat dowel should break then another can be replaced in two pieces using a copper / steel sleeve to join them. 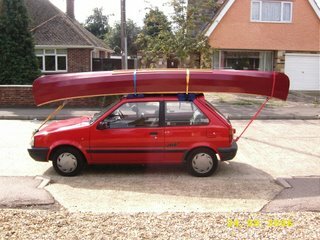 I am going to use some of that rubber matting (the type you can get for your dashboard to stop keys and phones slipping about) along the inside for slip resistance and a little comfort if kneeling, my Dad happens to have some in green so this will match nicely. The boat is out the front of my house on trestles at the moment but I will be putting up the tent again to get the job done once and for all, a FINAL PUSH!